As you consider a heating and air conditioning system for your home, one of the first steps is to settle on the type of system you want. There are several HVAC system types and components you should be aware of. Furnace: Most homes use a furnace for heating. Gas furnaces that burn natural gas are the most common, but propane furnaces are popular in rural areas. Oil furnaces that burn home heating fuel are still being produced. Electric furnaces are also produced but are less common because they are expensive to operate. Air Conditioner: Also called a central air conditioner or an AC, it consists of a condensing unit that is installed outside and an evaporator coil (or indoor coil) installed within or above the furnace cabinet. Heat Pump: The design is nearly identical to that of a central air conditioner except that the functioning of the system can be reversed. The result is that during cold weather, instead of collecting heat inside the house and shedding it outside, it collects heat outside and sheds it inside. It is an AC that does double duty. Heat pumps are effective until temperatures drop into the lower-30’s at which point it becomes too inefficient for them to collect heat outdoors. Air Handler: This component is similar to a furnace except it doesn’t have a heating element. It houses the indoor coil and contains a blower fan to circulate air within the home’s ductwork. Air handlers are used with heat pumps. Those are the primary heating and cooling components in an HVAC system. There are different ways to configure a system. Some homes will have just a furnace for heating and no AC. Others will have a full HVAC system that contains heating and cooling components. Here are the most common configurations. These systems have one component installed outside and one installed inside. There are several types. Air conditioner split systems: These feature an AC installed outside and a gas furnace installed inside. These remain the most common split systems. Heat pump split systems: These will most often feature a heat pump outside and an air handler inside. The air handler may contain one or more electric heat strips to provide extra heat in cold weather. Dual fuel heat pump split systems: A dual fuel heat pump is one that can be included in a split system along with a gas furnace. The heat pump can be used for heating during cool weather and the furnace used during very cold weather. In cool weather, heat pumps cost less to operate. In cold weather, gas furnaces are more cost-effective. As the name implies, all the HVAC components are housed in a single cabinet outside the house, usually on the ground but possibly on the roof. They are not as efficient as split systems and are typically used only when the construction of the house makes it difficult to install components indoors. For example, package units are common in homes without basements. They are also widely used in commercial buildings. Gas/electric systems: These feature a gas furnace and an air conditioner. Heat pump systems: These include a heat pump and an air handler. Dual fuel package systems: A heat pump is included with a gas furnace for heating options. Standard heat pumps, also called air source heat pumps, draw heat from the outside air during heating and disperse heat into the air during cooling. Geothermal heat pumps use the stable temperatures underground for both heating and cooling. They are also called geo thermal heat pumps or ground source heat pumps. They are far more expensive than standard heat pump systems because they employ a loop which is 300-500 feet of underground pipe that circulates water heated/cooled by the ground. They are more efficient than air source heat pump because it is easier to get heat from 55F water than it is to get it from cold winter air and it is easier to disperse heat into 55F than it is into hot summer air. Which components or HVAC system type is right for your home? That will depend on your climate, the construction of your home, and your budget. 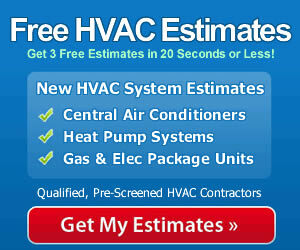 These are your primary options and you can use this guide to discuss specifics with an HVAC contractor in your area.